Quite a few hedgehog books and owners recommend the use of rubber or leather gloves when handling hedgehogs, but gloves are NOT a necessary part of hedgie handling. The rationale behind using gloves is so that you will be more comfortable handling your pet and that the spines will not poke you. We teach all of our customers how to handle our hedgie babies without gloves. The hedgehog can get more comfortable with your movements and you won’t be as fearful of its movements. However, using gloves to learn how to pick up your hedgie is better than not handling your hedgehog at all, or not having the confidence to pick up your hedgehog properly. 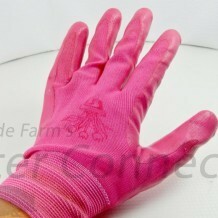 We suggest using cotton gardening gloves with rubber coated palms and fingers or very thin leather gloves. Thick leather gloves are stiffer, harder to maneuver, and more difficult to take off. Many hedgehogs do find leather tasty and may nip at the gloves, but simply leaving the gloves in your hedgehog’s cage overnight should remedy this situation. It is a good idea to sleep with your gloves under your pillow or tuck them into your shirt so that they are completely permeated with your smell. That way the hedgie will associate the gloves with you. Use the same method to pick up your hedgehog with gloves as you would without gloves. Let the hedgehog uncurl in your hands and begin to walk around. Once the hedgehog has begun to relax you can start to remove your gloves. Take one glove off and allow the hedgie to get to know your bare skin smell when you and your hedgehog are comfortable with each other. Once one glove is off and the hedgehog is still comfortable you can take off the other glove.